Volumes 1 and 2 of the Village Vet books. What’s your favourite veterinary book? I don’t mean textbooks – though I certainly have favourites there. I am talking veterinary biography, a genre made famous by Alf Wight (better known as James Herriot). There are an increasing range of titles to choose from, and I must confess these books are a guilty pleasure of mine. I love reading about the cases, client interactions and challenges of colleagues in the profession. Anthony Bennett and James Carroll, best known for the TV series The Village Vets, teamed up with Mark Whittaker to write a couple of books about their cases, and these are a brilliant read. 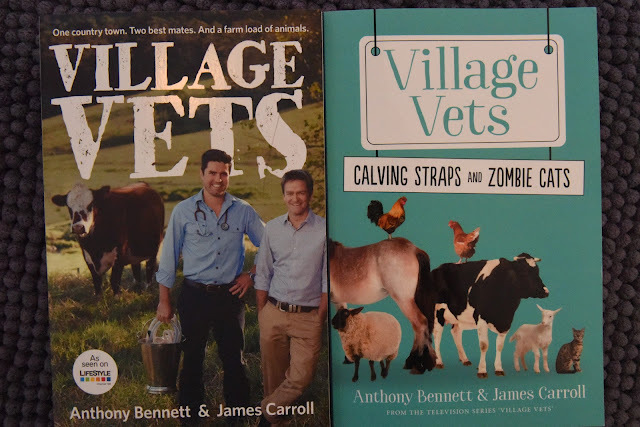 “Village Vets” and “Calving Straps and Zombie Cats” are two great reads, published by ABC books. At this point I should declare that I went to uni with Anthony and James, but I don’t think I am biased. The books are fascinating and entertaining, as well as very moving. Anthony and James are honest about poor as well as good case outcomes. There is one chapter in the first book, Village Vets, where Anthony documents a calving with a devastating outcome and his subsequent meltdown. They write about being on call in mixed practice, a physically, mentally and emotionally demanding experience. And they talk about some remarkable cases – a cat that was revived after being deceased for almost twenty minutes. A triplet calving. A field colic surgery. In an age where our media seems to want to project a certain image of veterinarians, these books are refreshing. The cases are described in a way that provides enough detail to be of interest to vets, yet accessible enough for someone who doesn’t perform calvings or surgeries for a living. And peppered throughout are observations and insights I found myself nodding vigorously about (in fact a few times I was moved to text the authors, which they probably found a bit weird – sorry about that, it’s hard to curb one’s enthusiasm). I definitely recommend these books to anyone with an interest in veterinary careers or mixed practice. (You might also like OutbackVets). And I’m hoping that the Village Vets write a few more books – in between their on-call shifts, working days, practice management duties, volunteering, filming and family-raising.